This is my 200th post. That second hundred felt like it passed more quickly than the first hundred (which I commemorated here, and also commented on how quickly it arrived). It did, actually; the first hundred took 6 months to write, while the second hundred only took me five. Part of the reason for that is the Today at Kingsfords that I’ve been including, and as a result I’ve been writing more often, simply because there’s so much to write about in the summer months. I expect I’ll be scaling back a bit now that winter is upon us again, to maybe posting every couple of days or so. Probably that third hundred will be a full 6 months again. In my 100th post I wrote about the things I was seeing by the hundreds. It was easier to do at that time of year. In the Canadian November one might write about hundreds of snowflakes, or fallen leaves, possibly (if you have an active feeding station) hundreds of feeder birds (or at least dozens). Hundreds of trees in the forest? Wavelets on the lake? At some point you just start reaching. Summer is better for multitudes. So I couldn’t do anything quite as catchy to tie into the milestone theme. I considered doing a post on a 200-year-old (or approximately) tree in the area, but I don’t think there are any trees that old around here. At least not massively monstrous trees, with thick girths that you need three people to form a ring around, and spreading crowns that shelter the surrounding forest. Instead I settled on writing about a tree that could get that old, if given good growing conditions and a decent chance. Okay, okay, it’s a bit of a stretch for a tie-in. Really I had the subject already picked out and the photos edited when I realized it was my 200th post. 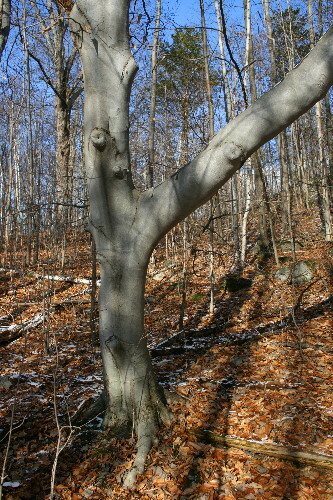 The tree that inspired the post was a moderately large American Beech (Fagus grandifolia) that I came across while hiking in the forest. What caught my eye about this particular beech wasn’t its thick trunk or the unusually stocky side branch (see photo above), which I figured will probably be a casualty of a strong wind or ice storm some years down the road, when the strength of the wood isn’t enough to maintain support of the giant weighty limb. You don’t often see horizontal limbs that are the same circumference as the main trunk. As interesting as this was, it was actually the texture of the bark that grabbed my attention. The lower limbs, where they had broken off, had been grown over by new bark and resembled amputated limbs, similar to the arbutus of the west coast, which I mentioned in a post back in February. The bark was wrinkled like it was beginning to sag a bit with age, giving it an almost skin-like appearance. Above each stub was a rift in the bark, a scar, arching in an inverted U shape, circling nearly half the trunk. 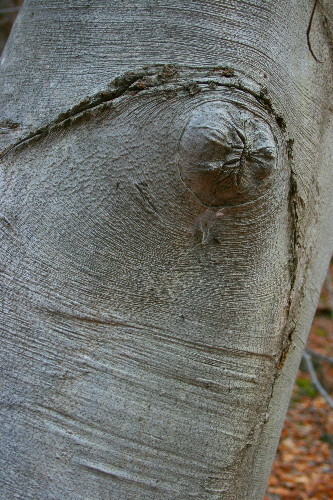 The reason for the scars wasn’t clear, but I assume it to be the same process that created the amputated limbs, and the wrinkles in the bark. On the bonnie, bonnie banks o’ Loch Lomond. Okay, sappy spiritual moment is finished. Aside from the evergreens, beech trees lend one of the few spots of colour in the woods at this time of year. 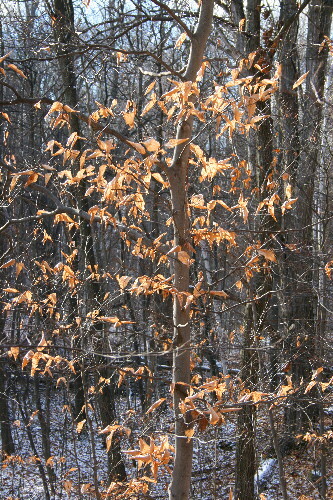 The leaves of young beech are marcescent, meaning they wither and die, but remain attached to the plant until the spring when the growth of the new leaf buds finally pushes them off. A few species do this, including oak and hornbeam, but it’s the beech that are most common and catch one’s eye in the woods. 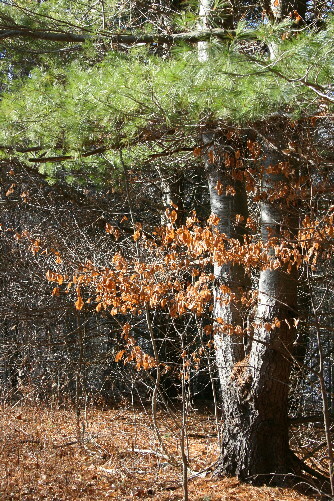 Beech nearly always grows in deciduous or lightly-mixed woods, and is not found further north where forests begin to become more strongly coniferous. It tends to be associated with Sugar Maple, Yellow Birch and Eastern Hemlock. Although it doesn’t tend to grow unusually tall, not usually exceeding 80 feet (24 m), old individuals may eventually develop thick trunks up to 4 feet (1.2 m) in diameter. 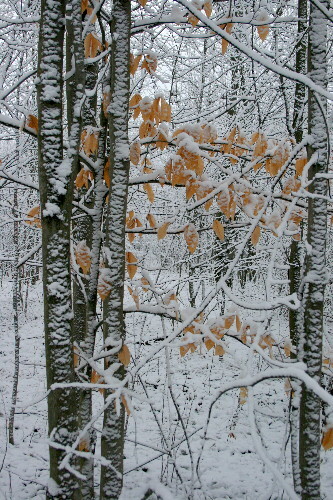 There are ten species of beech, Fagus spp., but only one is native to North America. The species has popped up now and again in the history of the early settlers; for instance, beech leaves were used in favour of straw in early mattresses, as they had a springiness that the latter material lacked. Also, the smooth bark of the beech makes them ideal trees for carving one’s initials into, and the resulting engraving can persist, legibly, for a long time. A beech in Louisville, Kentucky, bore the engraving “D. Boon kilt a bar 1803”. Although the engraving may or may not be a fake, the particular section of beech trunk has been preserved in the Filson Historical Society in Louisville. Aside from providing food and shelter to animals, the trees have many uses for humans, too. Many beeches are used in making quality furnitures, and can also be used to make the shells of drums (the instrument). The wood burns slowly but strongly, making an excellent firewood. This quality is also exploited by beer-makers as several, including Budweiser, use the wood in their production process. Beech pulp is used in making the textile fibre Modal, a type of rayon. Of course, the tree itself is often used as an ornamental, and several European species are found in North America in this application. Like many deciduous trees, the fruit of the beech is a nut known (unsurprisingly) as beechnuts. They’re contained in a burr-like outer shell, are sweet-tasting (or so I read; I haven’t tried them myself), and are very nutritious, as nuts go, being about 20% protein and 20% fatty oil. They also contain a substance that can be slightly toxic, and eating large quantities of the nuts (a few dozen) can make you ill. Beechnuts used to be pressed for their oil, in tough times such as following WWII, when people would be willing to collect the nuts from the forest and bring them to a local mill. It’s time-consuming compared to many mass-produced oils, however, and so it’s not commonly made anymore. Congratulations on your 200th post, Seabrooke! It’s hard not to anthropomorphize a tree that seems to be clad not in bark but in skin. I need to learn to identify more trees. Very interesting information about the Beech tree. You should publish your favourite posts in a book.